Small volumes of anti-AFP antibody vial(s) may occasionally become entrapped in the seal of the product vial during shipment and storage. If necessary, briefly centrifuge the vial on a tabletop centrifuge to dislodge any liquid in the container`s cap. Certain products may require to ship with dry ice and additional dry ice fee may apply. 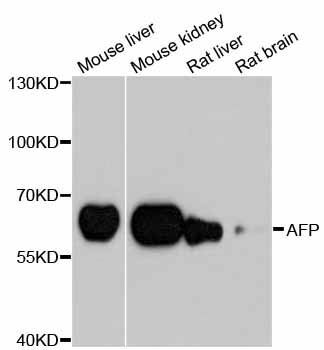 Alpha-fetoprotein (AFP) is a 65 kDa glycoprotein found in the serum of the mammalian fetal liver, yolk sac, and GI tract. While AFP expression in adult cells is low, it is aberrantly expressed in adult liver cancer cells (1,2). The tumor suppressor gene p53 and beta-catenin are both involved in the regulation of AFP expression. In normal adult cells, p53 binds to the repressor region of the AFP gene, thereby blocking transcription. Mutations in both p53 and beta-catenin are associated with aberrant expression of AFP. Elevated serum levels are predictive of hepatocellular carcinoma (3). Western blot analysis of extracts of various cell lines, using AFP antibody at 1:1000 dilution. 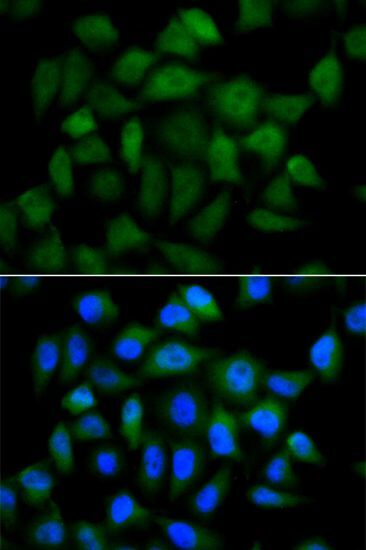 Immunofluorescence analysis of HeLa cells using AFP antibody. Blue: DAPI for nuclear staining.